Hot water streams through the finely ground coffee and into the ceramic cup waiting below. When the whir of the espresso machine stops, Gennaro places the doppio (double shot) on the counter and turns the cup just so. 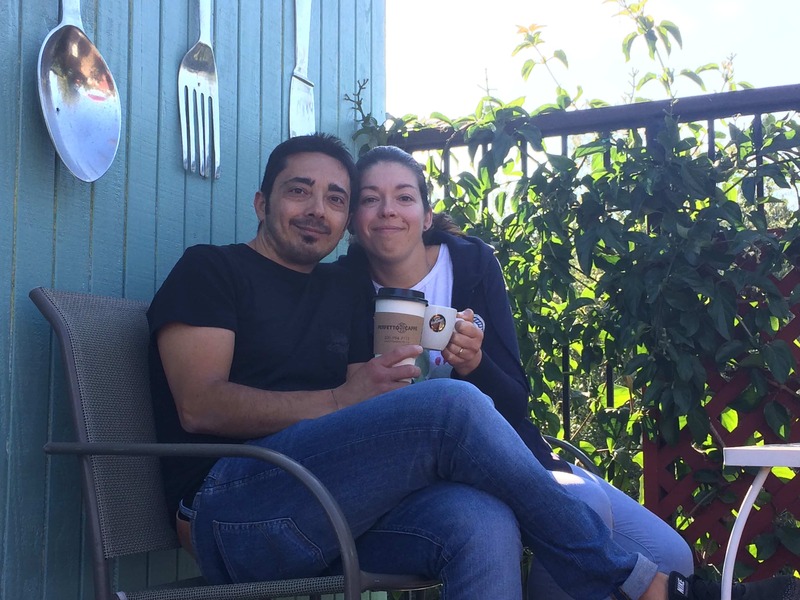 Making great coffee is part of daily life for Gennaro Daffuso and Laura Zuffi, the husband-and-wife team and owners of Perfetto Caffe near Arroyo Grande. But just as there are many hidden steps needed to make a great espresso (selecting the best beans, roasting to perfection, grinding correctly to bring out the most flavor), there’s more to the story of Perfetto Caffe than just two people opening a café that serves Italian coffee, sweets, and savory dishes. Laura was working at a coffee shop in her hometown of Bologna, Italy, while she was in college. During her shift, a man frequently came in for dinner and watched the soccer matches on the big-screen TV. Since he always came alone and not with a group of friends, she started saving him a good seat. Not being completely focused on the match, this man eventually asked Laura out for coffee. Sharing life and crescentina con la mortadella in Bologna. Gennaro and Laura started dating. When Gennaro got a promotion and moved back to his hometown of Milan, Laura finished her engineering degree at the University of Bologna. After they met in 2005, Laura and Gennaro discovered their shared passion for traveling. They took many trips through Italy and Europe, as well as three vacations to the US. On one trip, they drove from Washington DC to the Florida Keys. Another trip took them through Utah, Wyoming, and Nevada. And in 2012, they got their first taste of California and the Central Coast. “We landed at LAX, and then drove through San Diego to the Grand Canyon and Death Valley, then on to Yosemite and Sequoia.” From there, they headed south through San Francisco and made their way down the coast: San Simeon, Cayucos, Morro Bay, San Luis Obispo, and Pismo Beach. 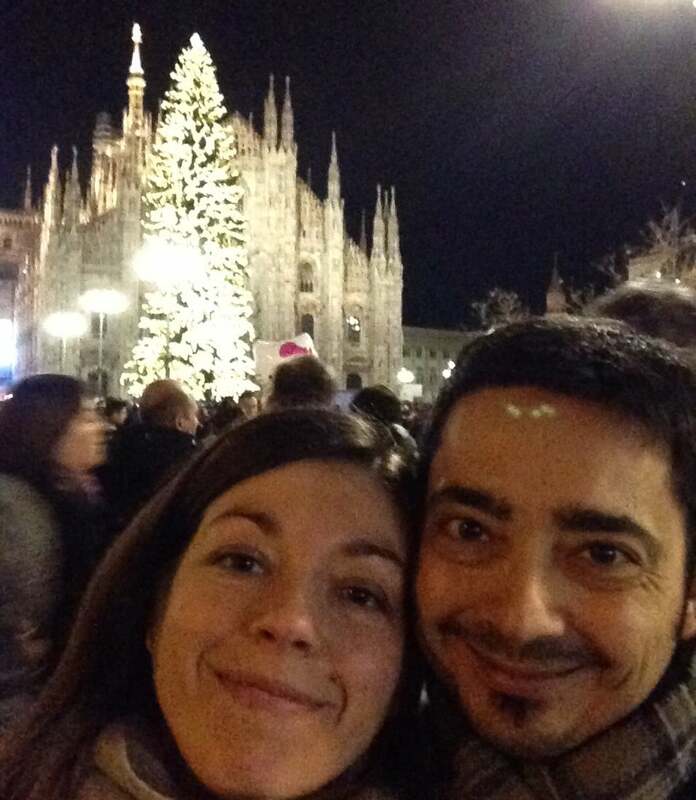 Laura and Gennaro were happily living and working in Milan and foresaw a good, comfortable future with their careers, family, and friends. But they both share the core belief of “why not?” If you don’t try something, you’ll never know what might have happened. Throughout their careers, this belief opened doors to new opportunities and adventures. Enjoying life in Milan, with the Dome in the background. Laura’s first engineering position was with a coating company. When the company decided to open an office in Ireland, they asked her to manage setting up the new office and connecting the new general manager in Ireland with the Italian team. “I thought, ‘why not’?” she said. The project went very well, and the experience showed her that you can create something from nothing. You simply make the right plans and take it one step at a time. Gennaro was a senior sales manager in the food industry. After 10 years with Cadbury, Gennaro’s boss was going to a new company and asked if he wanted to join him there. Why not? He joined his boss at Yakult, the Japanese probiotic drink manufacturer, and for the next seven years established operations in Italy. Then, another new opportunity arose, this time with a German dairy products company that wanted to expand its presence in northern Italy. Each year, the United States selects 50,000 people to come to the US with a work visa and a green card. The odds of being “extracted” from the huge pool of applicants are very low—millions of citizens around the world apply. In 2015, Gennaro was extracted as one of the 10 million people who applied that year. Even with all the places in the US they had visited previously, they knew there was only one place they wanted to live: the California Central Coast. 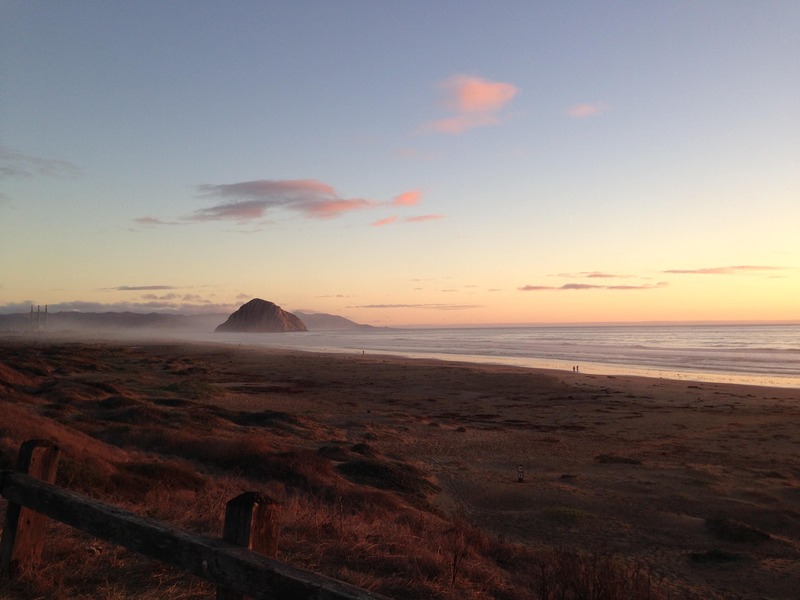 Laura and Gennaro captured this shot of the iconic Morro Rock on their first trip to the Central Coast in 2012. Little did they know a few years later, they would make a new life nearby. As the move date got closer, they discussed what type of business to start. With their shared experience working in coffee shops and their love of coffee and the good experiences it brings to people, opening a coffee shop and cafe made perfect sense. After they arrived in California in September 2016, they began looking for a business location. Their options were to find an empty space to convert into a coffee shop, or take over an existing location. 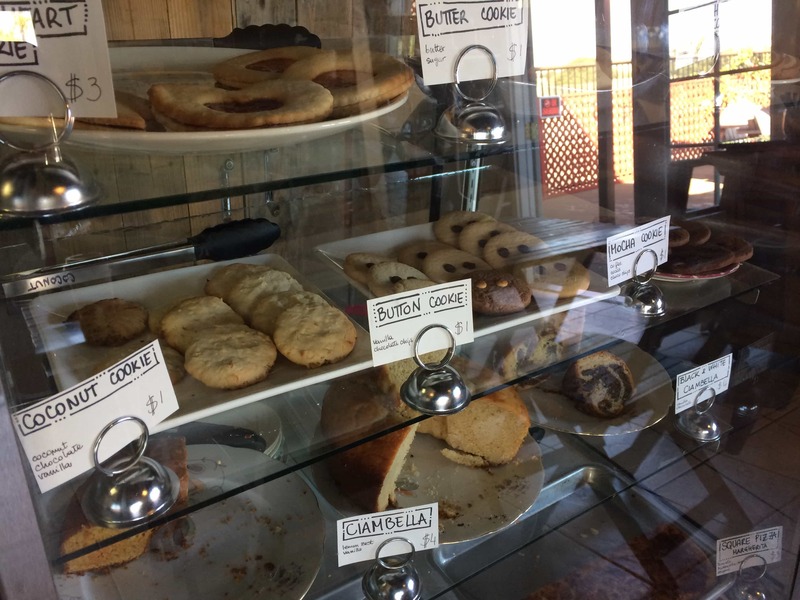 The coffee shop at the corner of Highway 101 and Camino Real (it shares the parking lot with AJ Spurs) came on the market. They took over in April 2017, made a few changes, and opened a few weeks later. 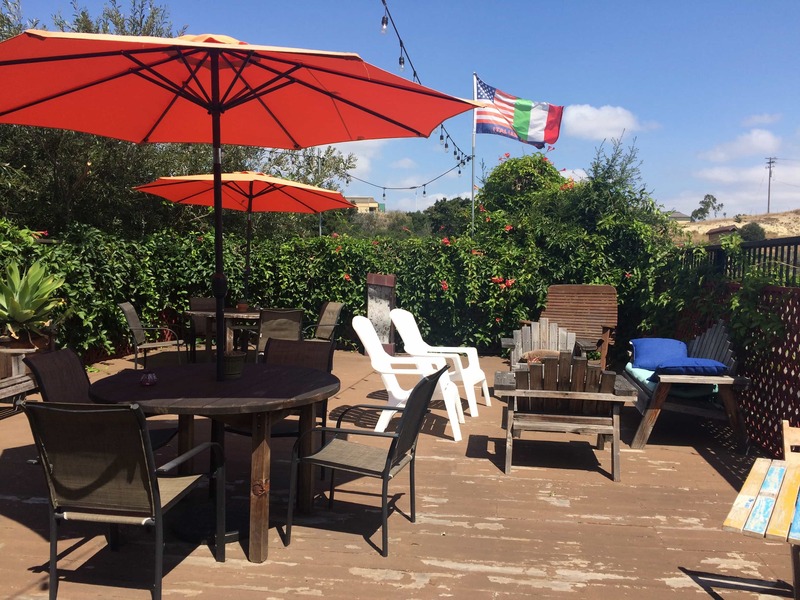 The back patio of Perfetto Caffe is a perfect place to enjoy great coffee, a sweet or savory treat, or a fresh salad. And most importantly, time with cherished people. “When we cook at home and something is good, we say ‘it’s perfetto’—perfect,” explained Laura. 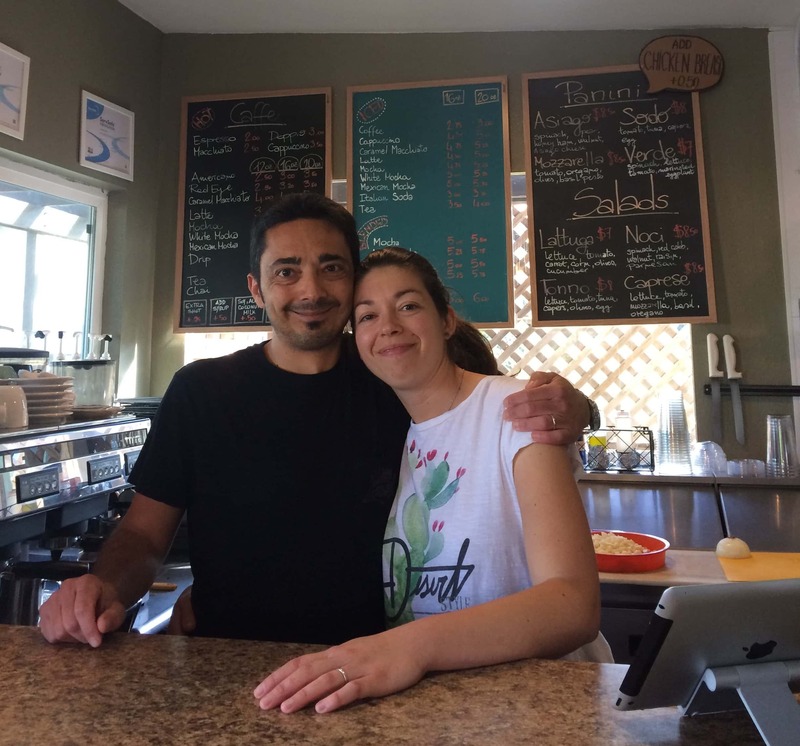 Laura Zuffi and Gennaro Daffuso share their love of food, coffee, and a welcoming hello at Perfetto Caffe near Arroyo Grande. From the start, their business recipe is to share what they love and to be who they are. “We always want to welcome people who come into Perfetto Caffe the same way we would like to be welcomed when we visit a place,” said Gennaro. 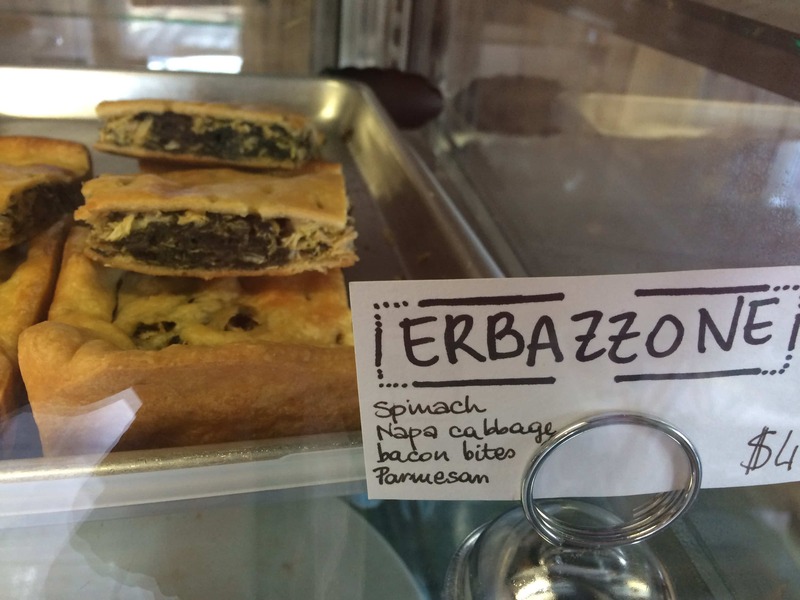 Laura makes a variety of savory Italian dishes, including Erbazzone, pizza, and more. Judged by the many happy and repeat customers, Laura and Gennaro have got it right. The coffee they use for espresso is the same coffee they enjoyed in Italy: Vergnano, a company founded near Torino in 1882. “We wanted to share this coffee because we love it,” said Laura. “With both our coffee suppliers, it was important to us that we like the product and we like the people,” added Gennaro. The selection of sweets, all from family recipes, changes with the seasons. 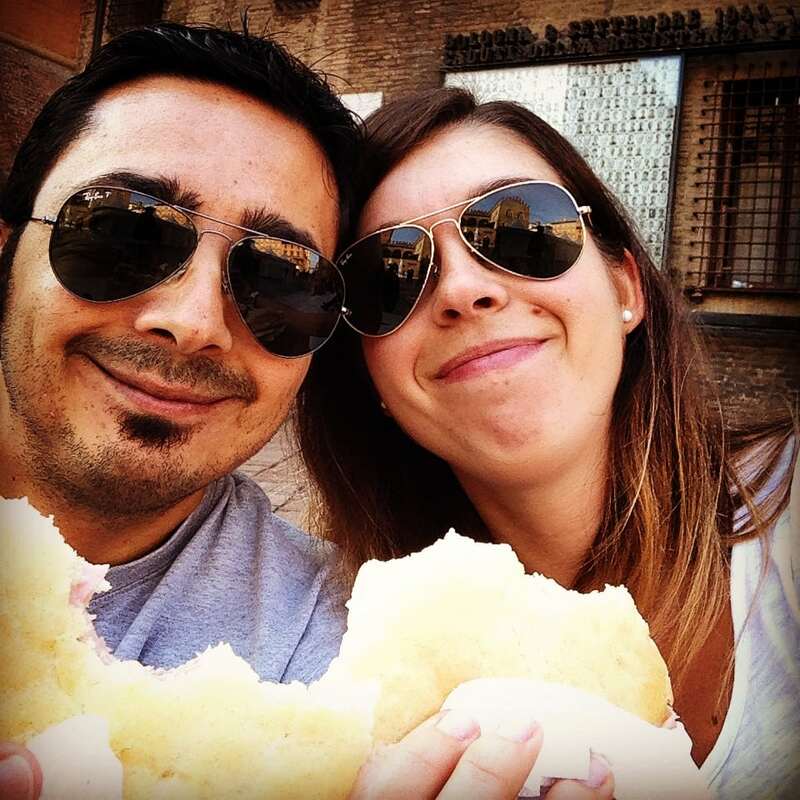 Flavors and smells have deep connections to memories, and Laura and Gennaro knew they wanted to provide food they would like: fresh, tasty, authentic. Laura and Gennaro take a rare coffee break on the back patio of Perfetto Caffe. 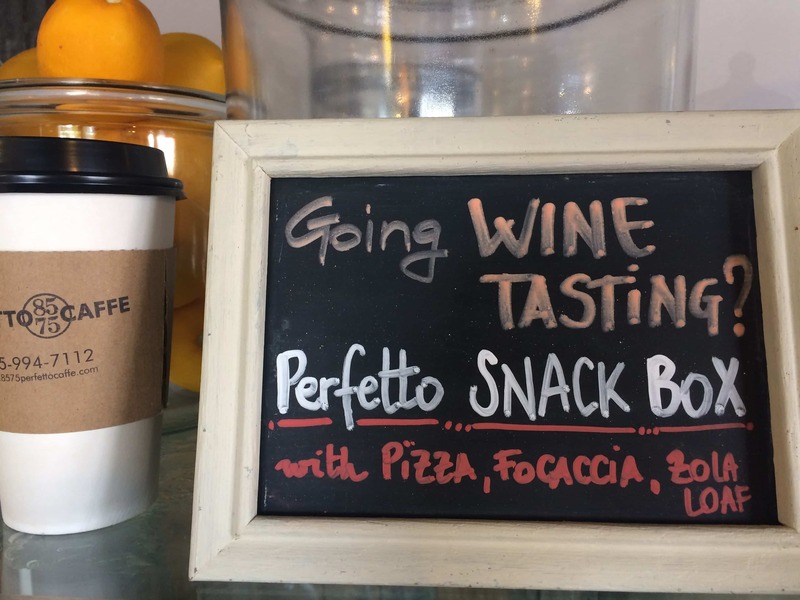 If you’re going wine tasting, be sure to pick up a box lunch from Perfetto Caffe. Using their combined business experience, they are doing what they know makes sense. So far, things are going very well. “Opening our business has been even better than we hoped. Everyone has been so welcoming,” she said. It’s midmorning and a couple walks in to the bright and cheery Perfetto Caffe. “Good morning!” they say. Based on their smiles and genuine warmth, you might assume these customers are locals who come every day. But you’re not sure. They might be just passing through. 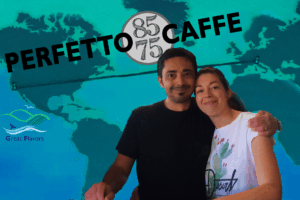 Laura Zuffi and Gennaro Daffuso share the best of their Italian roots in their quaint 8575 Perfetto Caffe. Lucky for all of us, Laura and Gennaro decided to take their winning lottery ticket and share what they love from their home country. 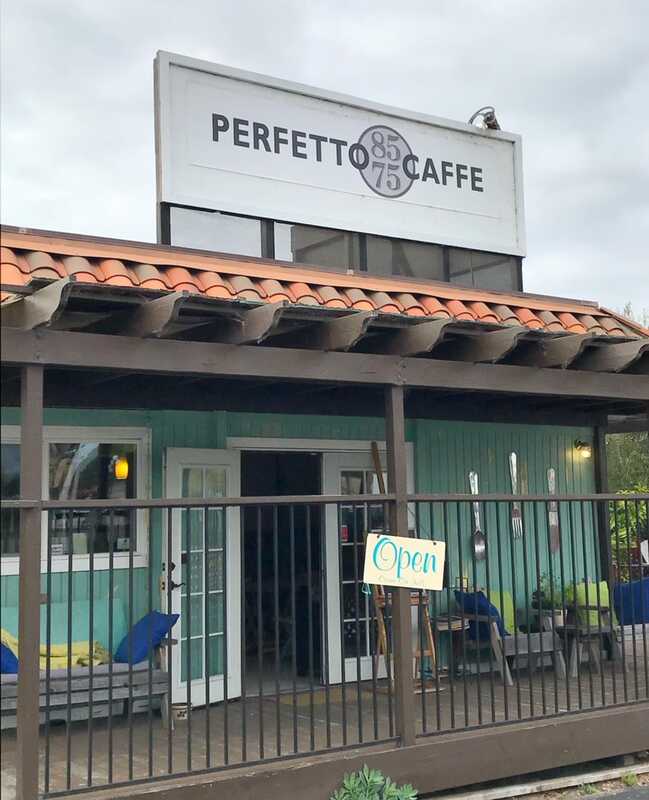 Stop by soon for a perfetto caffe at Perfetto Caffe and you’ll experience firsthand the welcoming spirit of these special people and the warmth of Italy. What an excellent story here! Perfetto! Thanks for sharing your appreciation of Perfetto Caffe! Laura and Gennaro are the best, and we agree–so glad they answered yes to “Why not?” Hope to see you there soon.